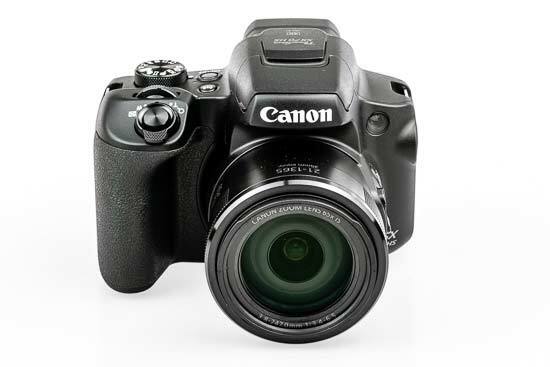 The Canon PowerShot SX70 HS is a superzoom compact camera that boasts a huge 65x optical zoom with a 35mm-equivalent focal range of 21-1365mm. 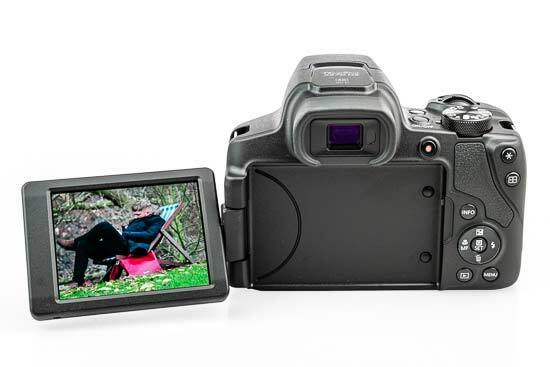 Its new 20.1MP high-sensitivity CMOS sensor promises excellent image quality, especially as it’s paired with Canon’s latest high-end DIGIC 8 processor. This also enables up to 10ps continuous shooting and 4K video capture with stereo sound. 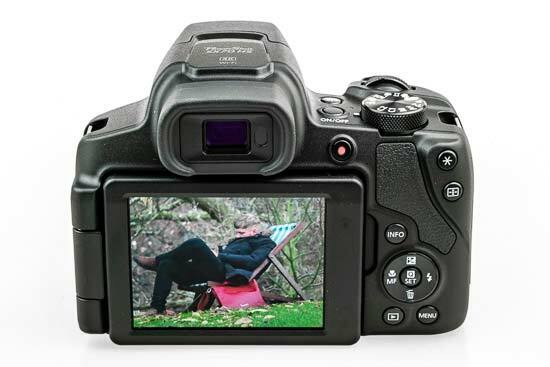 The camera isn’t short on other features either, with a 2.36-million electronic viewfinder with an eye-sensor, flip-out LCD display, clever Zoom Framing Assist function, built-in Wi-Fi and Bluetooth for easy image sharing and remote camera control, plus plenty of creative effects. The Canon PowerShot SX70 HS has an official RRP of $549.99 / £519.99 / €599.99. We reviewed the Canon PowerShot SX70 HS's predecessor, the SX60 HS, 4 years ago in 2014, and externally little has changed since then with the launch of the SX70. It's really inside the camera where Canon have made improvements, with a new image sensor, processor, faster continuous shooting, 4K video recording, higher-resolution EVF, and Bluetooth connectivity all now on offer. 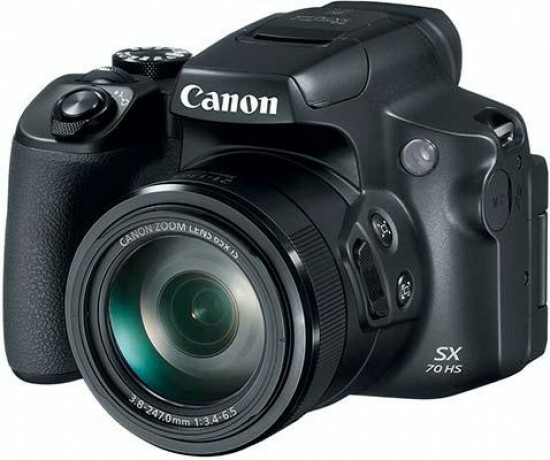 Externally the Canon PowerShot SX70 HS looks like the SX60 HS and most other high-end ultra-zoom bridge cameras too, which is to say it resembles a small DSLR camera. Considering it packs what’s currently one of the biggest zoom ranges in the business, the camera isn’t particularly large at 127 x 90.9 x 116.6mm, and at 610g it cuts 40g off the weight of the previous SX60 model. It boasts solid build quality, with a rugged plastic casing that’s free from flex or squeaks and a tactile rubber coating on the chunky hand and thumb grips. Considering the SX70 HS is such a feature-packed camera, its control layout is fairly simple and logical. Some buttons are a little more unusual though, like those positioned on side of the lens barrel. 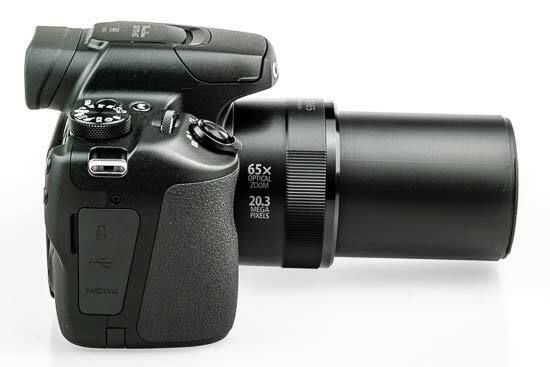 The upper button activates Canon’s Zoom Framing Assist function. When you’re zoomed in to the max, it only takes a tiny twitch of the camera to send a distant subject flying out of frame. Finding it again can be frustrating, but by pressing and holding the Zoom Framing Assist button, the camera automatically zooms out but leaves an outline of the original frame size on screen. Position the outline around your subject, release the button and the camera automatically zooms back in. The lower button on the lens barrel then helps prevent you losing track of your subject again, as pressing it enhances the camera’s image stabilisation to further iron out camera shake. The effect is minimal though, however the Zoom Framing Assist feature is handy and effective. A brand new control on the SX70 HS is a second Zoom control, located just in front of the Zoom Framing Assist buttons on the lens barrel. Naturally controlled with your left-hand thumb, we found it to be useful addition, especially when holding the camera up to eye-level and using the longer end of the telephoto lens. 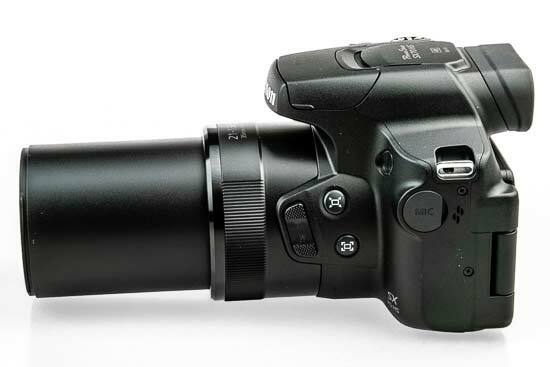 Sadly the Canon PowerShot SX70 HS dispenses entirely with the proper flash hotshoe mount of its predecessor, so you can no longer connect a separate flashgun or remote flash triggering device to this latest version. The camera’s built-in flash still has to be manually opened by pulling it upwards, rather than using a typical button release. Next to the flash there’s a useful button for establishing a Wi-fi or Bluetooth connection, and alongside it is the On/Off power button. Initial set-up of the Wi-fi and can be a faff, requiring you to manually connect to the camera’s wireless hotspot, especially as the camera no longer supports NFC pairing. The new Bluetooth feature is a lot easier to setup. However you connect though, the Canon Camera Connect app lets you wirelessly transfer images to a smartphone, tablet or computer, as well as print to a PictBridge-compatible printer. The app also allows you to remotely control the camera with your phone and add GPS data to your images (when connected via Bluetooth). There are also two dials on top of the SX70 HS. One is the front control dial just like you’d find on a Canon DSLR, which makes it far easier to adjust common settings like exposure compensation and aperture, rather than fiddling with buttons and menu settings. The main shooting mode dial sits behind this and provides instant selection of the camera’s auto, program auto, aperture and shutter priority modes, as well as a fully manual option, all great to see on a camera like this. Another mode worth mentioning is Hybrid Auto, which automatically captures a couple of seconds of video with each still and compiles everything into a video digest of your day. Then if you switch to the Creative Filters mode, a further seven individual filter effects can be applied as you shoot. With so many shooting options to choose from, remembering your preferred settings can be tricky, but thankfully the C1 and C2 modes allow you to save two custom setups for quick recall. The SX70 HS also gains an automatic panorama setting mode, something that was missing from the SX60 HS. The dedicated movie mode setting is what you need to choose to be able to use the SX70 HS' new 4K video recording feature. Thanks to its new sensor and processor, the SX70 can now record 4K video at 3840 x 2160 pixels at 30/25 fps, as well as the 1080p options that its predecessor offered. 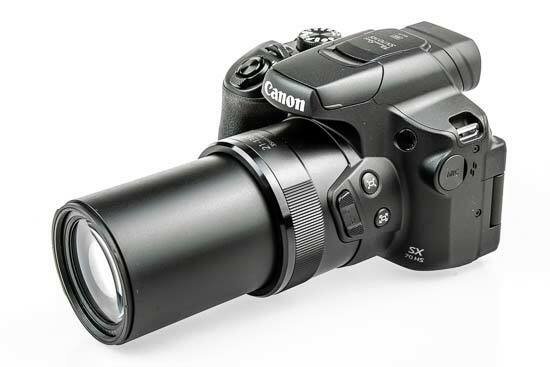 The Canon PowerShot SX70 HS's has both an LCD screen and EVF for image composition. Unfortunately the LCD screen still isn’t touch-sensitive, something that we complained about 4 years ago, and it also has exactly the same 922k-dot resolution, which is pretty low for a new camera in 2018. On the plus side, it does have great viewing angles which translate to accurate colour and contrast reproduction, regardless of your angle of view. The screen also benefits from being a fold-out unit, making it easy to compose high and low angle shots, as well as a good old selfie. Screen brightness is also high enough to be usable under direct sunlight, but if things get too bright, the electronic viewfinder is a useful alternative. The EVF has been improved since the SX60, now having 2.36-million dots rather than the 922k-dot resolution of its predecessor. 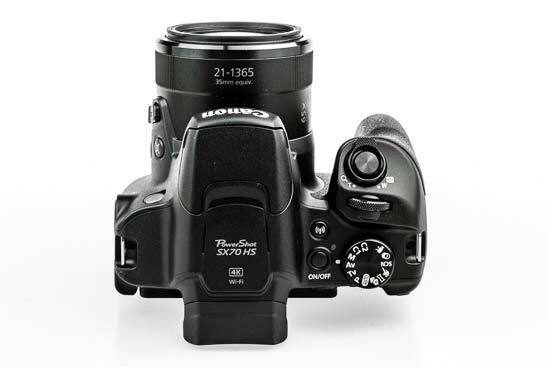 It also gains an eye-sensor which automatically switches from the LCD screen to the EVF when you hold the camera up to your eye, again something that the SX60 HS didn't offer, and again directly addressing another complaint that we made about that camera. Move to the back panel and we find a one-touch video record button to the right of the EVF, and then two buttons, the top one for exposure lock and the bottom one for selecting and locking the focus point. The function of these two buttons can be switched around if you so desire. There are also plenty of display preferences available during both live view and image playback, including RGB histograms, activated by pressing the Info button. Also on the rear of the SX70 is the usual directional dial pad that doubles as controls for exposure compensation, flash, macro/manual focus and delete options. Navigating the SX70 HS’ menu system is easy thanks to Canon’s tried and tested design and layout. Pressing the Menu button directly underneath the rear directional pad displays a menu overlay of commonly used shooting settings, though these do change according to which mode you’re in. 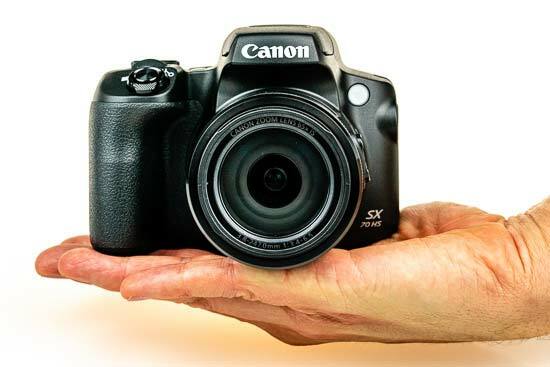 When it comes to shooting with the Canon PowerShot SX70 HS, the camera will turn on and be ready to fire a shot in a pretty quick 1.5 seconds. Focusing in good light is almost instantaneous, but dimmer conditions slow things to a sluggish 1.5-2 seconds. Zooming-in to the longer focal lengths can also cause some focus hunting and general slowness, and the system is sometimes unreliable in these situations, too. Exposure metering is absolutely dependable though and isn’t fazed by high-contrast scenes. The 10fps continuous shooting rate, up from 6.5fps on the SX60, is exceptionally fast for this kind of camera. The Canon PowerShot SX70 HS’s 325 shot battery life from its smaller 875mAh rechargeable Li-ion battery isn't quite as good as its predecessor's 340 shot life. By activating the SX70 HS’ Eco mode, though, the battery life can be eked out to around 405 shots through subtle power-saving measures.